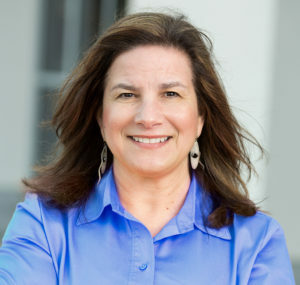 San Diego-based editorial director with decades of experience writing for myriad publications and organizations. Massachusetts-based creative director whose know-how, skills and talent have served clients for over 25 years. 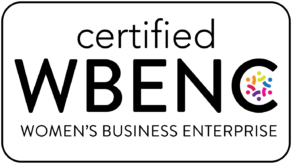 In addition to dozens of national and international writing and graphic design awards attributed to Anne and Maureen, the Twirling Tiger Media team was awarded multiple TABBIE Awards for both writing and design excellence from Trade, Association and Business Publications International in 2016, 2017 and 2018. We help you fill every stage of your buyer’s journey with engaging content that’s worth reading. Make the complex simple to reach all audiences. We distill specialized material into language and imagery that resonates with your target customers/members/clients. Use our journalism skills to create unique content. With backgrounds in journalism, our writers are seasoned interviewers trained to ask the right questions—and enough of them—to accurately and authentically reflect a brand’s goods, services and thought leadership. Provide both editorial and creative services. From concept to deliverable, our seasoned team collaborates to find the perfect combination of powerful style and impeccable clarity. 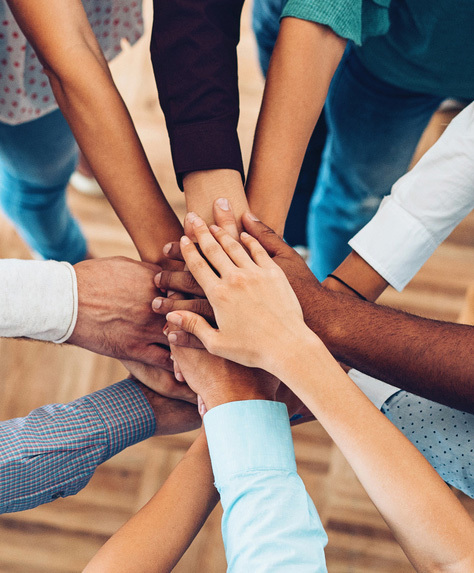 Bring more supplier diversity to your workforce. Twirling Tiger Media is certified as a Women’s Business Enterprise (WBE) by the Women’s Business Enterprise National Council (WBENC) and is a federally designated Women-Owned Small Business (WOSB). Why choose Twirling Tiger Media? You’ll forget we’re not staff. We’ll work with you, not just for you. When you hire Twirling Tiger Media, we become your adviser, your advocate and an important investor in your success. Our content is as fierce, whimsical and authentic as our brand. Our core values inspire excellence, creativity and integrity. And since we know you’re wondering about the name: co-founder Maureen Joyce and her then-teenaged daughter came up with it. Anne Saita loved the tagline, Content you can sink your teeth into. Our content company began at a lunch with a friend who mentioned that a digital magazine would be going out for bid. “I can do this,” Maureen told her friend. He warned there would be stiff competition for the prized contract from many mid- and large-sized content companies. This won’t be easy. Maureen was certain she could greatly improve the quality of the product, provide superior customer service and offer competitive pricing. 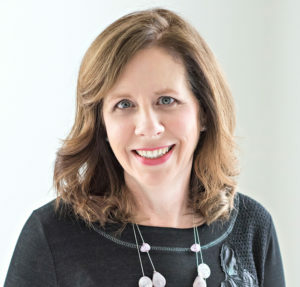 Anne Saita joined her as a managing partner and editorial director and on September 24, 2013, they officially launched Twirling Tiger Media. Maureen and Anne’s proposal for the digital magazine “knocked the socks off” the selection committee—and soon knocked the other bids out of contention. The experienced partners believed that a key to a content company’s success would be to offer clients a perfect marriage between writing and graphic design delivered by a highly talented team. Their goal was to also address a common problem in corporate communications divisions: bandwidth. Today, startups, trade associations and seasoned enterprises turn to Twirling Tiger Media to promote complex products and services that require accurate prose presented in brave, bold designs. We happily do the hard work; you reap the rewards. Twirling Tiger Media® is certified as a Women’s Business Enterprise by the Women’s Business Enterprise National Council (WBENC) and is a federally designated Women-Owned Small Business (WOSB). Why choose Twirling Tiger® Media? How does Twirling Tiger Media distinguish itself from competitors? Make the complex simple to reach all audiences. We distill specialized material into language and imagery that resonates with your target customers/members/clients. Use our journalism skills to create unique content. With backgrounds in journalism, our writers are seasoned interviewers trained to ask the right questions—and enough of them— to accurately and authentically reflect a brand’s goods, services and thought leadership. Provide both editorial and creative services. From concept to deliverable, our seasoned team collaborates to find the perfect combination of powerful style and impeccable clarity. We are 100% women-owned (and certified! ), bringing more supplier diversity to your workforce. Twirling Tiger Media is certified as a Women’s Business Enterprise (WBE) by the Women’s Business Enterprise National Council (WBENC) and is a federally designated Women-Owned Small Business (WOSB). Why should I hire Twirling Tiger Media for content creation services? We have a proven record and strong client retention rate, as well as more than 50 years of combined experience working with a variety of businesses across different verticals. Are your services fully insured? Our work is fully insured againt errors and omissions, so there’s peace of mind working with our writers, editors, designers, and photographer and illustrators. We also hold a general business liability policy. If you have a need for content—words and imagery—that can effectively engage your target audience and convey your thought leadership, we’re here to help you advance your brand. We already work with agencies and freelancers. Why work with you? We can easily complement work done by another agency or freelancers, but there are clear advantages to you when hiring our boutique-sized company. At Twirling Tiger Media, we focus on teamwork and creativity. Our team of talented individuals excel in their area of expertise and work together to achieve the best results—on brand and on time. Large agencies and publishers require projects to pass though many layers of bureaucracy and often outsource their work to boutique-sized content providers … like us. More budget for other projects (avoids high-priced agencies and one-dimensional skilled freelancers). Quicker turnaround time if your in-house talent is already stretched in resources. Better synergy between writing and design elements which elevates audience engagement. More creative solutions through teamwork. Cross-platform results for complex projects. High quality custom content is our focus. Efforts are not diluted. Easily work within your organization’s culture. We partner with you to develop your content strategy and production schedules. A proven process that assures high quality. Repurpose content into powerful new opportunities. Award-winning creative and editorial direction at the helm. We serve all industries and provide targeted writing and design services that are unique to a specific marketplace. Are you “a one-source content provider”? 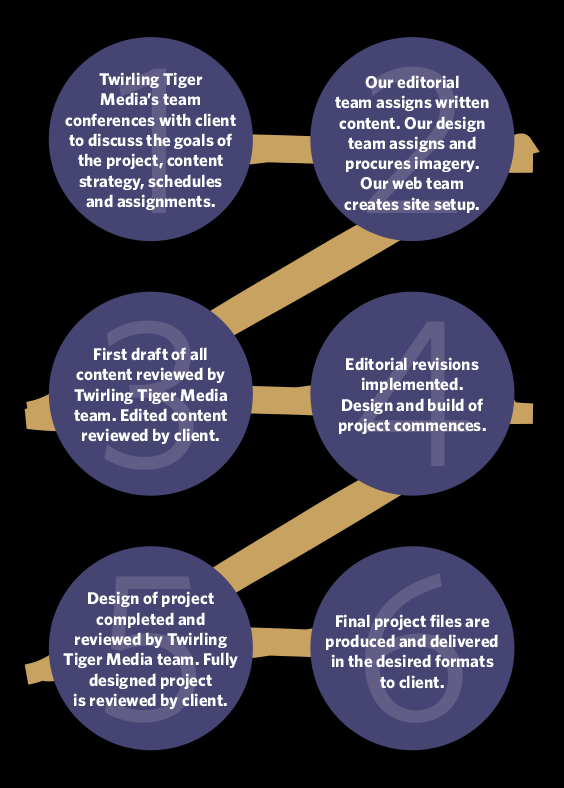 Twirling Tiger Media manages all aspects of a project—from initial concepts to final deliverables. Do you have an established and reliable workflow for projects? Yes, Twirling Tiger Media has a proven process workflow that ensures quality results. Twirling Tiger Media’s workflow begins with an ongoing dialogue with our clients’ key staff members in order to review and fully understand the goals of each project. Our six steps, broadly outlined here, assume the formation of an established project objective and production schedule. Our credible and trustworthy content flows through an extensive process that includes editing and review by copy editors, fact-checkers, proofreaders and designers to ensure quality. 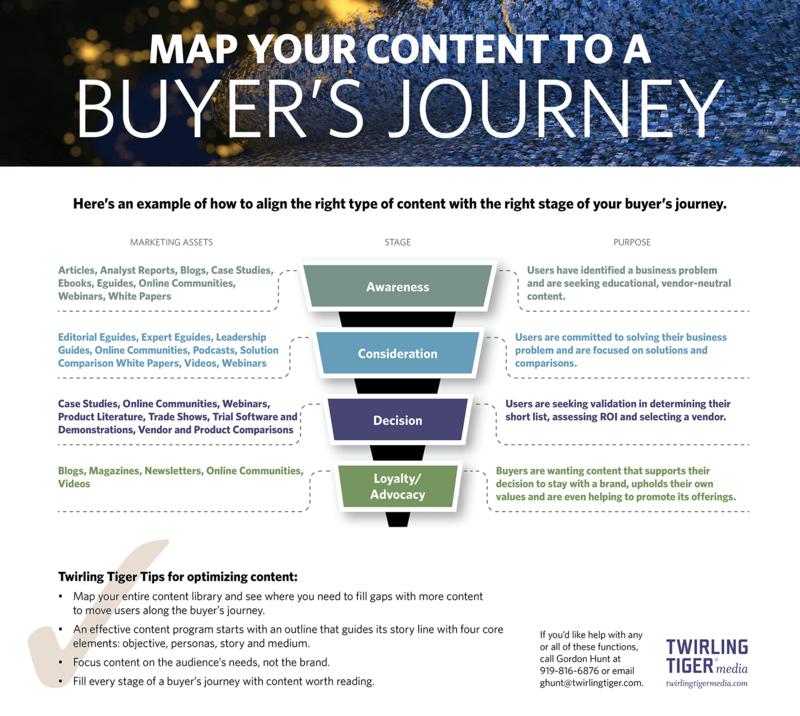 Filling every stage of your buyer’s journey with engaging content that’s worth reading. We provide a steady stream of content skillfully tied to your company’s products and services that engages buyers and business partners. From concept to deliverable, we are a comprehensive content creation solution. What we create: Articles, blog posts, case studies, ebooks, magazines, media announcements, newsletters, podcasts, social media, success stories, video, web content, webinars, white papers and more! What is custom content and content marketing? Custom content is content meant to build an affinity with an existing audience. This content reinforces the brand, communicates the value of products or services and creates new opportunities. It’s branded content and used to maintain engagement with existing customers. Examples are publications and e-newsletters. Content marketing is predominantly outward-facing content created to attract and acquire new customers. It can be branded content, but it can also be simply brand-relevant content. Examples are white papers, blogs and social media. There is some overlap between custom content and content marketing, and Twirling Tiger Media can deliver exceptional solutions for both engaging existing customers and attracting new audiences. What are the top functions of content? What if I don’t have a content strategy or I need to improve an existing one? Our experts will discuss marketing objectives and work with you to create an effective content strategy, or find ways to improve your existing strategy. We don’t have a marketing team. Where do I start? We can work directly with a marketing team, or with one or more of your key staff members. We’ll maintain an ongoing dialogue with key staff members to fully understand a project’s goals. It’s the crucial beginning step in Twirling Tiger Media’s proven process workflow. It all starts with a conversation. What if I need a lot of help with various projects? There is a huge benefit for your brand when Twirling Tiger Media handles multiple projects for your company because we’re able to offer consistency in voice and style across each deliverable. We’re here to help! Contact us today to discuss your next project.